You can download a walking tour brochure here. The houses listed here are representative and are not intended to be an exhaustive list of historic resources in the district. The neighborhood was developed as a prestigious upper middle class area bordered by workers' cottages on the east, north and later to the west. It represents the only area developed as a professional residential neighborhood on the west side of town. Residents included a lawyer, a railroad conductor, store owners and employees of the Showers Brothers furniture company. 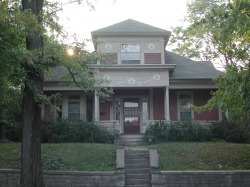 The architecture of the district represents various "high styles" popular between 1890 and 1925, a time of growing affluence in Bloomington. Queen Anne, Free Classic and Period Revival style houses, some designed by prolific Bloomington architect John Nichols are present. 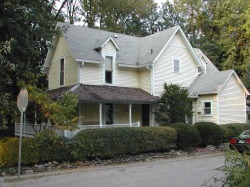 There are also several examples of vernacular style houses, two mid-nineteenth century houses with Greek Revival and Federal details and bungalows and American four-squares of the 1920s. 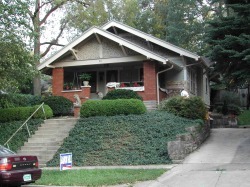 This diverse group of homes is a microcosm of Bloomington's overall residential history. 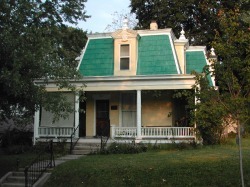 The Prospect Hill Historic District was listed on the National Register of Historic Places in March 1991. 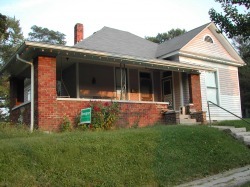 Within the year, district residents were also successful at establishing Bloomington's first locally designated historic district. Please respect the privacy of the owners by viewing all listed buildings from the street. 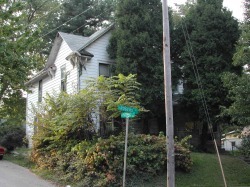 This was the boyhood home of the local businessman and developer, Ralph Rogers. An example of the Elizabethan Revival, the floor plan remains unaltered since its construction in 1906. This house, as well as others on Rogers, reflects the variety of styles that became popular nationwide following the Philadelphia Centennial Exposition in 1876. Note the classical porch columns and the use of stucco. 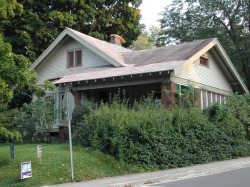 This bungalow was built by Mr. Buchanan, a local blacksmith who had a shop on Madison Street. Inside, there is lovely pecan surface molding and the floors are diagonally laid hardwood. 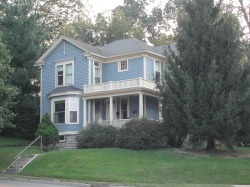 Thomas Sare, a local lawyer, built this Dutch colonial Revival house. It has a large bay window. Palladian windows and a gambrel roof. Its floor plan is a variation of one found in John Nichols' catalog, indicating that he may have designed this house. This Free Classic style house was designed by architects Crapsey and Lamm for Wood and Anna Wiles. Mr. Wiles was the proprietor of Wiles Drug Stone on the square. Notice the unusual diagonal wood siding on the front and sides and the classical garlands and wreaths. The garage once housed the family horse and surrey. 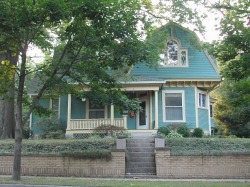 Built by the Fulwiders, once owners of a lumberyard on Madison Street, this is a two-story Queen Anne with a gabled roof, several side porches and bay windows. The interior has been carefully restored and features a lovely cherry staircase and a parquet floor in the entry. 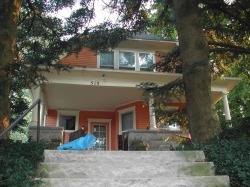 This Queen Anne style house was designed by architect John Nichols. Asymmetrical in plan, it has Queen Anne decorative details. 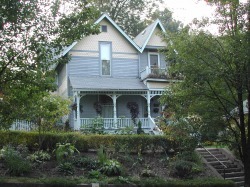 Architect John Nichols designed this Queen Anne style house for Mr. and Mrs. Ira Dillman. It has double front gables, a steeply pitched roof and various textures on the facade. Stained glass decorates the front window and others around the porch. An original barn can still be found in the back yard. John Nichols designed this quasi-elliptical house with diamond-paned windows for Narrie and David Stewart. The Free Classic style is evident in the pedimented front porch and dentiled frieze. The floor plan is similar to Nichols' own house at 820 North College. Designed by John Nichols for William Fogg in the Free Classic style, the house retains many original features, inside and out. 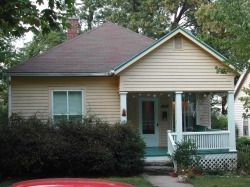 Notice the wrap-around porch with Doric columns. 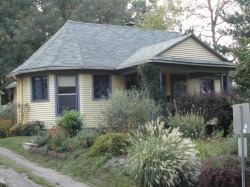 The establishment of Bloomington's first local historic district in Prospect Hill was the impetus for the restoration of this wood frame cottage. The crossed gable form gives the house a modified T-shaped plan, and wood cornice returns on the end gables show the Greek Revival style. 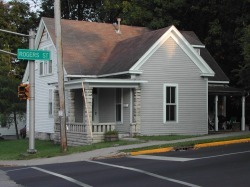 This is one of Bloomington's earliest remaining buildings. There is an underground creek, which flows on the south side of the house. Governor Paris Dunning signed the original deed after the property was purchased at a sheriff's sale. 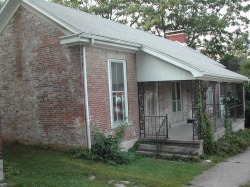 Several frame additions have been made to the rear of this brick house; the iron railings and roof of the front porch are also alterations to the original structure. This house is a traditional house type known as a Central Passage. The stucco and pebble finish on the front gable adds individuality to this classic example of the bungalow. 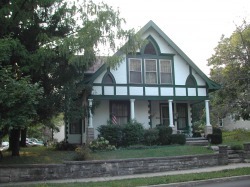 This Free Classic style house was built for Mickey Burke, a conductor on the Monon Railroad. He and his wife had one child and lived in the house until Mr. Burke died in the late 1950s. 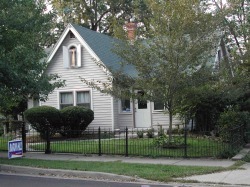 The eclectic style of this simple 1930s house is defined by the front-facing gable with shuttered upper window, the crossed gable form and the decorative wrought-iron fence. The fence was made by Austin Seward, an early Bloomington blacksmith, and moved here from another location. This simple frame cottage was sensitively rehabilitated in 1980 through the City's Department of Housing and Neighborhood Development; the interior floor plan has been slightly modified, but the exterior remains largely authentic. Another cottage very similar to its neighbor to the east, this house has been modified by a rear addition and displays limestone porch columns. An early owner worked in the Showers Brothers furniture factory. Bay windows and stained glass add charm to this modified bungalow. The interior has been remodeled and substantial modifications have been made to the rear of the house. This elegant early brick building combines elements of the Federal and Greek Revival styles. 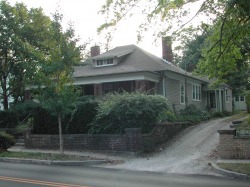 The house was individually listed on the National Register of Historic Places and completely restored in the 1980s. 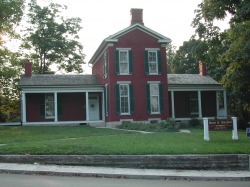 Built by Enos Blair around 1845, the house was owned for some years by Paris Dunnings, who served as an Indiana state representative and senator, president of the state senate, lieutenant governor and governor. He was also president of Indiana University's board of trustees. 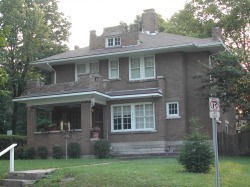 The American four-square form of this house is embellished with Mission Revival style parapets and is built of brown brick with limestone trim. The design is identical to the "Alhambra," a house kit available form Sears, Roebuck and Company in the 1920s. Notice the matching garage at the rear. The outstanding feature of this turn-of-the-century house is the extraordinary mansard roof. The house was built by Al Hayes, a tinsmith, who applied the decorative pressed metal sheets and baroque window heads. A narrow veranda wraps around three sides of the house. In the rear is a small, separate building constructed in the 1920s to isolate and provide fresh-air therapy for a family member who suffered from tuberculosis. The L-Shaped plan of this pyramid-roof cottage is formed by the projecting front gable. The exterior wood siding and interior floor plan were restored in the early 1990s. Thanks for taking the tour. 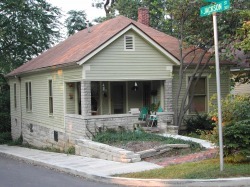 Come on out and visit us in person sometime to walk the historic sidewalks and view these homes!